Blue skies, hot sand, lapping waves: Nothing says "summer" quite like some quality beach time. Unfortunately, a few not-so-fun hazards can ruin your fun in the sun. Here are ten tips to help ensure a blissed-out beach day. Always swim near the lifeguards. You're five times more likely to drown if you're swimming at a beach without a lifeguard. Check this list to find beaches staffed by USLA-certified lifeguards. Look for beach flags. Flags indicate risks. Typically, a red flag means high surf or strong currents, and yellow indicates medium risk. Purple means stinging wildlife sightings, and green means all clear. When in doubt, ask the lifeguard. Always swim with a buddy. They can help (or at least wave for help) if needed. Also known as rip currents, these narrow channels of water can occur in oceans or large lakes. They move from shore outward, rather than the other way around, and can pull you farther out. "Riptides are the number one danger at the beach, responsible for almost 80% of all USLA rescues," says Gill. The USLA estimates that riptides are responsible for nearly 100 fatalities every year in America; in 2015, lifeguards rescued 48,000 people caught in them. Rip currents can form in strong wave conditions, but also near soft spots along the shore, like sandbars, piers, or jetties; sometimes they look like a harmless line of seaweed or different-colored water. If you find yourself caught in one, don't fight against the current—instead, swim parallel to the shore until you break free. 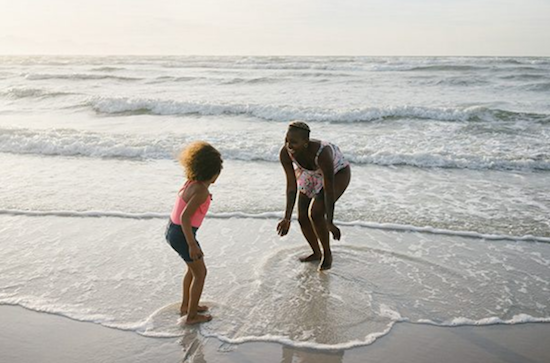 Use about two tablespoons of a broad-spectrum, water-resistant sunscreen of at least SPF 15 (protecting against both UVA and UVB rays), suggests the Centers for Disease Control, and reapply every two hours or after swimming—especially between the hours of 10 a.m. to 2 p.m. Combine with other sun protectants, like an umbrella and a hat (but avoid straw hats with holes, which let in rays). The CDC says to protect yourself from heat stroke, consume enough water or non-alcoholic beverages to keep you going to the restroom every few hours, and seek shade. Symptoms of heat stroke include a body temperature of greater than 103, a racing heart, flushed skin, nausea, and vomiting. The FDA recommends keeping coolers at 40 degrees or below. Bring along two of them: one that will be opened and closed frequently, for drinks; and another for perishable items that stays mostly shut and in the shade. Inside the perishable cooler, keep items separate so they don't leak on each other. And don't let perishables sit out of the cooler for more than two hours—or just one hour if the temperature is 90 degrees or above. July and August are peak auto-theft season and according to the Insurance Information Institute, lock your doors and keep valuables you don't need at home. To secure your stuff on the sand, take only the bare minimum of valuables to your beach blanket. Consider a waterproof waist-pack or pouch so you can take necessities with you when you swim, or anti-theft tote bags that can be tethered and locked to your beach umbrella. Stepping on a jellyfish can cause stinging, burning, blisters, or tingling. Most stings don't require a doctor's visit, according to the USLA. Rinse with saltwater, pluck out any tentacles with tweezers, and then soak the area in a hot tub or shower. Contrary to the urban myth, urinating on the area does not help. Head to the hospital if you have difficulty breathing, or if you faint or vomit. Lightning can strike within ten miles of a thunderclap, says NOAA—so once you hear one, get off the beach and go inside an enclosed building (a picnic shelter will not protect you). It's safe to go back to the beach 30 minutes after you hear the last rumblings. There are fewer than 100 unprovoked shark attacks per year worldwide, according to NOAA—but it's still wise to be aware of them. Tom Gill offers some tips: Don't swim at dawn or dusk; don't wear shiny jewelry in the water; stay away from areas with large numbers of bait fish near the shoreline; and cover up any wounds. Also known as red tides, this phenomenon occurs when toxins in fresh or salt water—sometimes a result of chemical runoff—turn the water a reddish color. These blooms poison marine life and affect people, especially those with asthma. NOAA tracks current HABs; a beach with a flag system or signs may also warn you to stay away.